Material type: Book; Format: print ; Literary form: not fiction Publisher: Sebastopol, CA : O'Reilly Media, c2009Online access: Inhaltsverzeichnis Availability: Items available for loan: IIITD [006.76 REE-C] (1). Material type: Book; Format: print ; Literary form: not fiction Publisher: Boca Raton : CRC Press, Taylor & Francis Group, c2013Availability: Items available for loan: IIITD [REF 004.67 ZHO-I] (1). by Hwang, Kai | Fox, Geoffrey C | Dongarra, J. J. Material type: Book; Format: microfiche ; Literary form: not fiction Publisher: Amsterdam ; Boston : Morgan Kaufmann, c2012Availability: Items available for loan: IIITD [004.678 HWA-D] (1). Edition: 3rd ed.Material type: Book; Format: print ; Literary form: not fiction Publisher: Farnham : O'Reilly, ©2012Availability: Items available for loan: IIITD [005.74 WHI-H] (1). by Antonopoulos, Nikolaos | Antonopoulos, Nick | Gillam, Lee. Material type: Book; Format: print ; Literary form: not fiction Publisher: New York : Springer, c2010Availability: Items available for loan: IIITD [004.36 ANT-C] (1). Items available for reference: IIITD [REF 004.36 ANT-C] (1). by Hill, Richard | Hill, Richard. Material type: Book; Format: print ; Literary form: not fiction Publisher: London ; New York : Springer, c2013Availability: Items available for loan: IIITD [REF 004.6782 HIL-G] (1). Items available for reference: IIITD [CBIA 004.36 SHR-E] (1). by Gupta, Pranab Kumar Das | Nayak, Manojranjan | Pattnaik, Sabyasachi. Material type: Book; Format: print ; Literary form: not fiction Publisher: Delhi: PHI Learning ©2013Availability: Items available for loan: IIITD [004.36 GUP-C] (1). Edition: 2nd ed.Material type: Book; Format: print ; Literary form: not fiction Publisher: New Delhi : Wiley, ©2012Availability: Items available for loan: IIITD [004.36 SAU-C] (1). Material type: Book; Format: print ; Literary form: not fiction Publisher: New Delhi : Wiley, ©2015Availability: Items available for loan: IIITD [004.36 SHA-C] (1). Material type: Book; Format: print ; Literary form: not fiction Publisher: USA : Create Space Independent, ©2012Availability: Items available for loan: IIITD [004.6 DOU-B] (1). Material type: Book; Format: print ; Literary form: not fiction Publisher: New Delhi : I.K. International, ©2012Availability: Items available for loan: IIITD [004.36 DUB-C] (1). Items available for reference: IIITD [REF 004.36 DUB-C] (1). Material type: Book; Format: print ; Literary form: not fiction Publisher: New Delhi : Universities Press, 2015Availability: Items available for loan: IIITD [004.67 BAH-I] (5). Items available for reference: IIITD [REF 004.67 BAH-I] (1). by Erl, Thomas | Mahmood, Zaigham | Puttini, Ricardo. 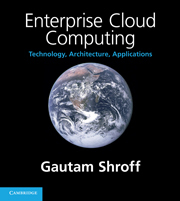 Material type: Book; Format: electronic available online Publisher: New Delhi : Prentice Hall, 2013Availability: Items available for loan: IIITD [004.6782 ERL-C] (1).